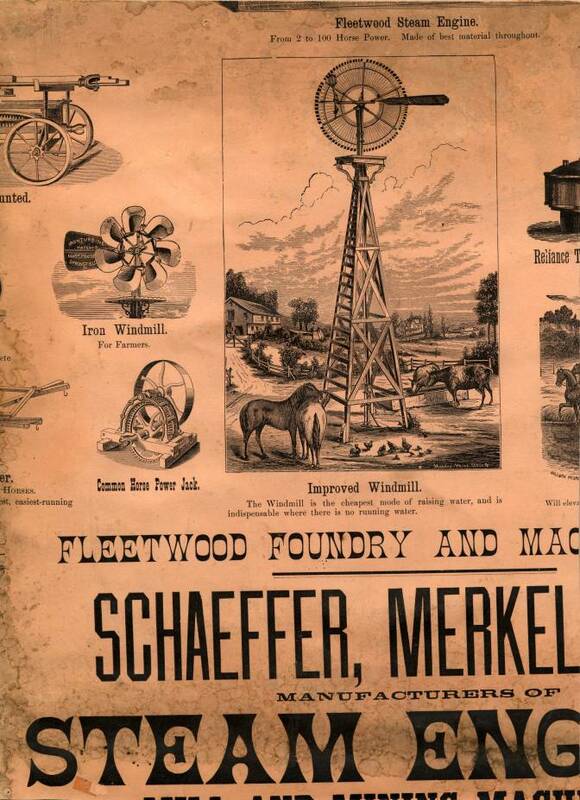 Beautiful certificate from the Centennial and Memorial Association of Valley Forge Company printed in 1878. This historic document was printed by the Geo S. Harris & Son Company and has an ornate border around it with a vignette of Issac Potts' house which was General George Washington's headquarters in the winter of 1777 at Valley Forge. This item has the original signatures of the Regent, Anna M. Holstein and Vice-Regent, and is over 135 years old. This certificate was mounted on an advertisment (See below). 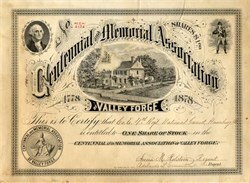 THE CENTENNIAL AND MEMORIAL ASSOCIATION OF VALLEY FORGE. The most important result of the celebration of the one hundredth anniversary of the Evacuation of Valley Forge was the determination to secure the headquarters as a memorial of that event. To accomplish this there was formed "The Centennial and Memorial Association of Valley Forge," of which Mrs. Anna M. Holstein was elected regent. This association really carried forward the work of "The Valley Forge Centennial Association," which had so successfully arranged for the celebration of the anniversary. The new association appealed to patriotic citizens for contributions, and for every dollar contributed a certificate was issued giving the holder a share of stock in the association. The house and one and a half acres of land were purchased for $6000, one-half of which was secured by a mortgage. Despite the efforts of the members of the association it was unable to pay the interest, and an appeal was made to the Patriotic Order of the Sons of America at its convention in Norristown in 1885. In a little more than six months the order paid off the mortgage and canceled all the indebtedness of the association, receiving in return 3600 shares of stock, and a voice in the management. Col. Theodore W. Bean, of Camp 114, did much toward the' success of this movement by the publication of his "Footprints of the Revolution," first published in the "Camp News." The State of Pennsylvania appropriated $5000 to further the work of the association, and in 1887 the building was restored to its original condition, as far as possible, a warden's lodge was built, and the grounds improved. Additional ground was purchased in 1889 and in 1004. The association maintained the headquarters in an excellent manner, and was aided in this by a small admission fee. In the report of the Valley Forge Park Commission, in 1904, attention was called to this fee and the recommendation was made that the State acquire the property. This received favorable action and on August 15, 1905, the Commission took possession of the headquarters under the new powers given to it by the Legislature, paying the Association $18,000 for its property. Later the Commission made the claim that the money could not he distributed among the members of the Association, because the shares of stock were only receipts for money contributed for a charitable purpose. The courts sustained the claim of the Commission, which received the monev as trustee.